ZP30-13 rotary tablet press is suitable for foodstuff, medical, chemical, electronics and other industries. ZP30-13 rotary tablet press meets GMP standards. The punching rod and the punching nail are combined to press different shapes of the products. It is not suitable for pressing semi-solid, wet particles, low solubility, hygroscopic materials and non-granule and fine powder materials. 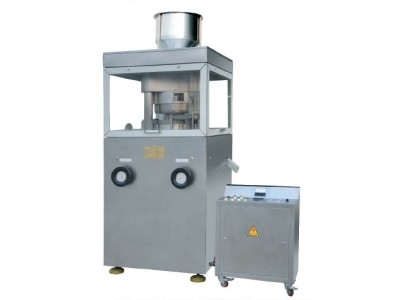 ZPS30-13 Rotary Tablet Press is suitable for pressing granular raw materials into round, blocky, spherical and annular tablets in foodstuff, chemical, electronics and other industries. But ZP30-13 Rotary Tablet Press is not suitable for pressing semisolid, wet particles, hygroscopic & low-melting-point materials and powder. 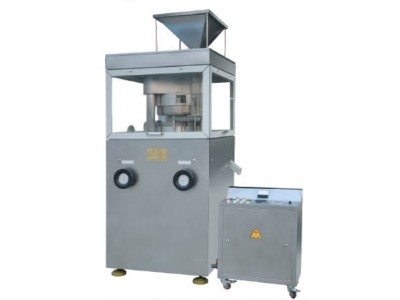 ZPS30-13 Rotary Tablet Press conforms with the requirements of GMP. The drill drift and drift pin is a combined type. If you want to change the specification, you just need to order required drift pins. 1. Drive system: motors (controlled by frequency changer) → pulley drive → worm drive → turntable, driven by the spindle, rotates clockwise. 2. The technological process for pressing of ZPS30-13 Rotary Tablet Press is continuously material feeding, filling and pressing. 3. When ZPS30-13 Rotary Tablet Press is working, the turntable, with 13 set of moulds, rotates clockwise. The moulds move up and down along the curve track, and complete pressing movement with the pressure roller. 4. Rolling friction of up and down pinch rollers will help reduce resistance and lower power consumption. 5. The safety unloading device is installed under the lower pinch roller, balanced by a spring. Their working pressure is adjusted by the spring. When over-pressure occurs, the spring will automatically unload, and electric cabinet will send an alarm signal. This helps to stabilize the pressure, reduce shock and vibration, and protect the punch. 6. Filling, thickness, rotational speed and other parts are under centralized control, which makes it easy to operate ZPS30-13 Rotary Tablet Press. 7. Submerged lubrication is used for the worm and worm gear to reduce power loss and extend service life. 8. The external part of ZPS30-13 Rotary Tablet Press is fully inclosed, so that the pressing room and the drive mechanism are entirely separated from each other. This design can prevent dust and avoid cross-contamination. 9. The electric control unit uses frequency step-less governor for easy operation and clear, concise panel. 10. Dust collector is installed to remove dust automatically.